Wedding photography is not only a passion of mine; I consider it a privilege. It’s an honor to be able to not only document your love, but to document two families becoming one. I love creating something tangible, authentic, and real. In a world that’s so fast-paced and filled with so many distractions it’s easy to lose sight of what matters the most; love. It’s not about pretty photos. It’s much more than that. It’s about love. It’s about those in-between moments when you think no one’s watching and you look into your love’s eyes and realize that this is exactly where you want to be and nothing else matters. It’s about time spent with your loved ones, celebrating two people and two families becoming one. It’s about making those intangible and unexplainable moments of joy, tranquility, and happiness...tangible. Life takes us on an unpredictable roller coaster ride. But love endures through it all. Twenty years from now when you look back at your photos, I want your photos to be a reminder of how you felt on your wedding day. I want you to remember that through your journey of marriage, love never fails. When life get’s tough, love perseveres. When life gets hard, love always hopes. When you look back at your wedding photos, I want you to be reminded of how lucky you are to love and to be loved. I hope that your wedding photos will help you to never lose sight of the fact that it all started with love. 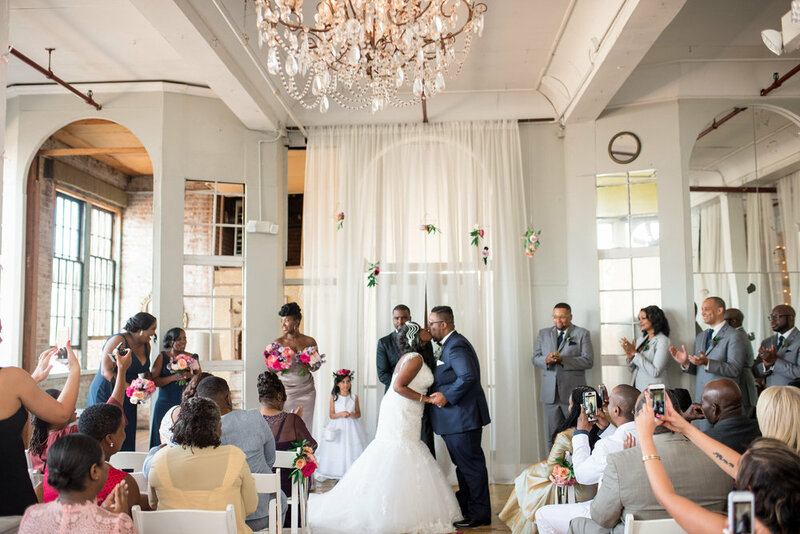 "Leandra was probably one of the best decisions my husband and I made for our wedding. " It's important to me to really connect with my clients. I want you to feel comfortable with me. If you're not comfrotable with me then you won't feel comfortable in front of my camera. Let's meet and talk about your wedding day. I love getting to know my couples and I want to know all about you. So let's meet. The engagement session is a great time to get to know me and used to being in front of the camera prior to your wedding day. It will also give you variety for your art work that you'll hang in your home. Engagement sessions are so fun and I really enjoy photographing them. As a former bride, I’ve been in your shoes. I know everything that goes into planning a wedding and the stress that comes along with it. That’s why I do everything I can to make the process run smoothly for you.It’s about connection for me. I’ll help to create your Wedding timeline to ensure you have ample time for photos. I’ll make sure you look and feel your best, and most of all that you feel comfortable behind the camera. I’ll be your dress fluffer, bouquet holder, boutonniere pinner, veil fixer; anything you need. No detail goes unnoticed and I will make sure you look AMAZING. And most of all, that you have fun! Expect lots of fun! As a boutique photography studio, I create personable experiences for all of my clients. 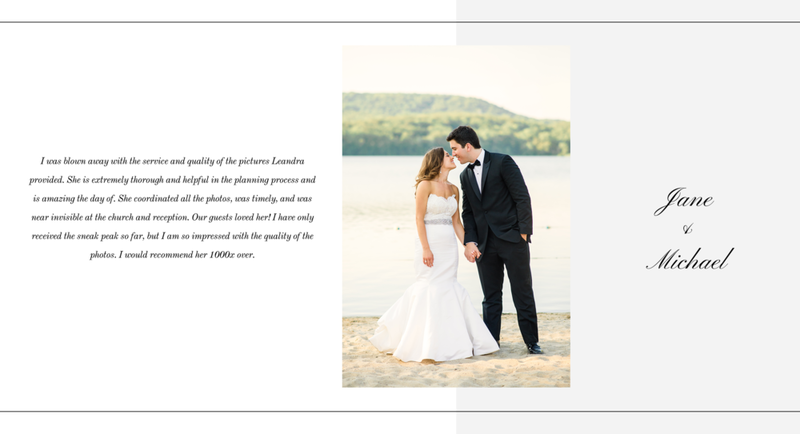 One of my favorite parts of the process is creating your Wedding album and your artwork. 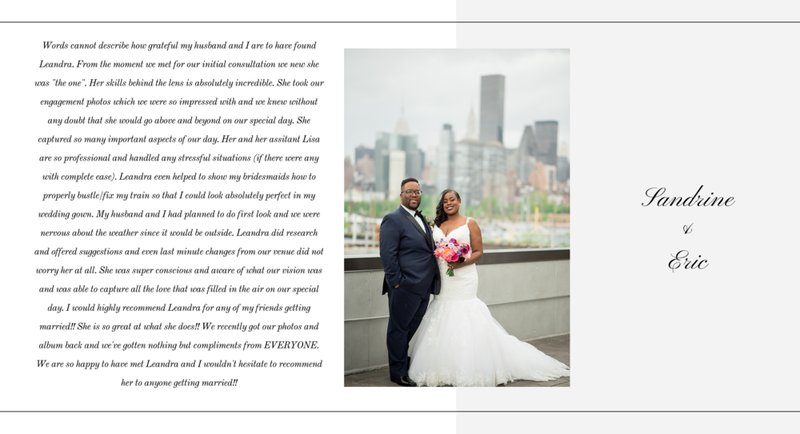 Photography by Leandra is a full service studio offering a range of products that will showcase your wedding photos beautifully. I believe providing my clients with a full experience and full service, and providing products is a big component of that. I'm a firm believer in printing your photos. There's nothing more special than holding your wedding album in your hands, or walking past your favorite wedding images hanging on your walls. For pricing and more information, contact me. I'm excited to hear from you!